A functional orthotic is a device designed to align and support your foot and ankle in the most anatomically efficient position. A custom or prescription orthotic is created specifically for your foot through the use of a cast mold. The finished orthotic device looks something like an insole for your shoe, and is usually made from a semi-rigid material. By correcting the alignment of your foot, a customized orthotic insert can redirect or dampen forces and motions to reduce strain and stress on multiple areas of your body. Orthotics are generally indicated for people suffering from problems with foot mechanics that result in localized foot pain, plantar fasciitis, bunions or hammer toes, and pain in the leg, knee, hip or back. Custom orthotics are particularly indicated when an individual has either excessive motions in their ankle and foot, or if they have limited mobility. 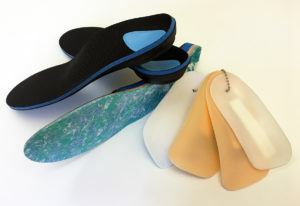 Custom orthotics are virtually always provided with customized exercises, advised by a physical therapy clinician, that are unique to that individual. Runners can sometimes benefit from custom orthotics. Because running is such a repetitive movement that generates higher loads on the body, abnormal alignment, motions and forces can result in pain and injuries. Orthotics can be used to address these issues for individuals to reduce pain or prevent injury. Abnormal forces and loads in the foot and ankle can be a result of problems within the foot itself, or can be a result of faulty movement originating in the back, hip, or leg. Our physical therapists are uniquely qualified to examine the entire chain, from the spine on down, and to assess what biomechanical adjustments can be made to restore optimal positioning of your feet and legs. After your evaluation, plaster molds will be made from your feet. They are then sent to an orthotist who will fabricate your orthotic inserts based on the prescription from your physical therapist. Turnaround time is around two weeks. We will call your insurer to verify coverage (some plans do offer coverage for this kind of durable medical equipment), otherwise a cash payment arrangement is available (Cost in 2017: $295 includes evaluation, orthotic fabrication, and a follow-up appointment for fitting).